The health of my two dogs is one of my top priorities. I want to ensure I get as much time as possible with them and that they are happy and healthy for every moment of it. Though there are some things that are out of my control, I can actually do a lot, as a pet parent, to help with my dogs’ health. One way that I try to provide my dogs their healthiest life possible is by including quality supplements as part of their regular diet. 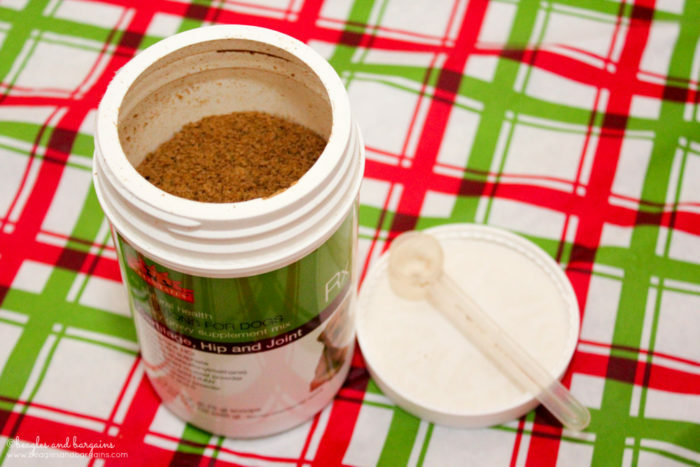 My top brand of choice when it comes to supplements is WellyTails. 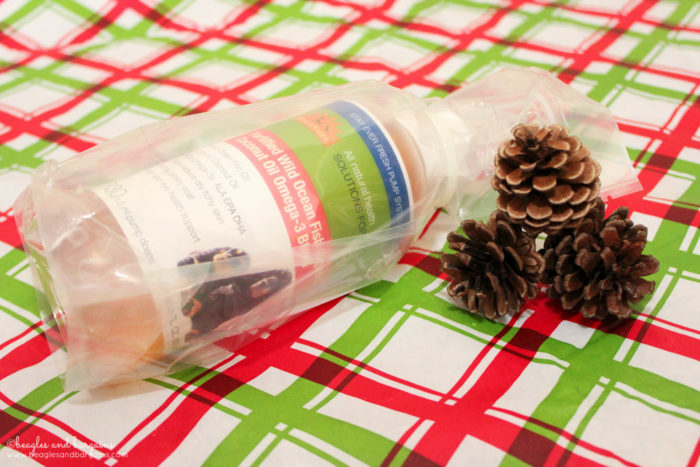 Lucky for your dog’s health, they are also the sponsor of Day #13 of our 2017 Stocking Stuffer Giveaways. I seriously can’t get enough of their fish oil. Okay, so I don’t actually use it first hand (because you know it’s made for dogs), but it has changed the lives of both Ralph & Luna SO MUCH. (Read more on that here.) 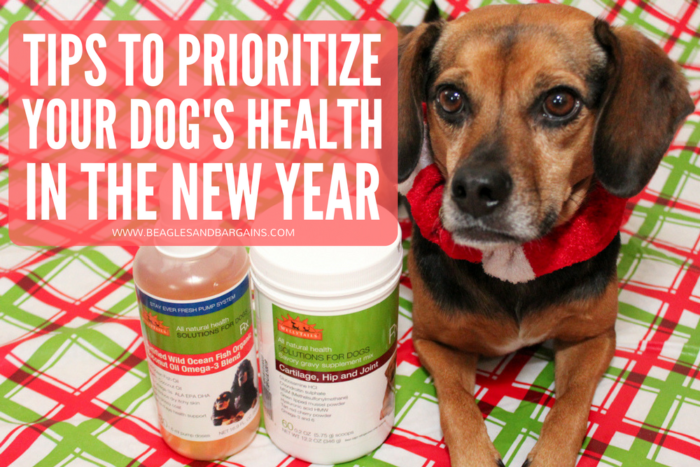 I challenge you to put your dog’s health first in 2018. Keep reading on for five ways to do just that and to find out how to enter today’s giveaway. Regular annual check up veterinarian appointments are important to ensure your dog is as healthy as he or she can be. (Don’t forget puppies and senior dogs may need to go every 6 months rather than once a year.) And, I bet you’ll be more likely to go if you schedule your pup’s next appointment now rather than waiting until it’s time. I know how many times “Call Vet” gets pushed down on my to-do list for “higher priority” items. Do it now, put it on the calendar, and get it out of the way for the rest of the year. My number one budgeting rule when it comes to having pets is to always put food first. 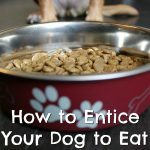 It’s what they eat every single day, so it can have a profound affect on your dog’s overall health and wellness. If nothing else, read the ingredient list on your dog’s food. 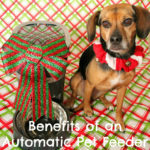 You should be familiar with what you are feeding your furry family member after all! Take it a step further and actually browse the aisles the next time you are at the pet food store or look up reliable ratings and reviews online. If your budget has changed, feel free to revisit what your dog eats. Hopefully, you’re seeing an increase in budget and can pick out a higher quality food the next time around. No matter what – buy the best you can afford. 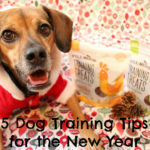 You’re dog’s health will surely thank you! As Luna is aging (CAN YOU BELIEVE SHE’S 6 ALREADY? ), I’ve been looking into adding a hip and joint supplement as well. Since losing her ability to walk and play would certainly affect her quality of life, I want to add a supplement as a preventative rather than waiting for signs of pain or decreased range of movement. 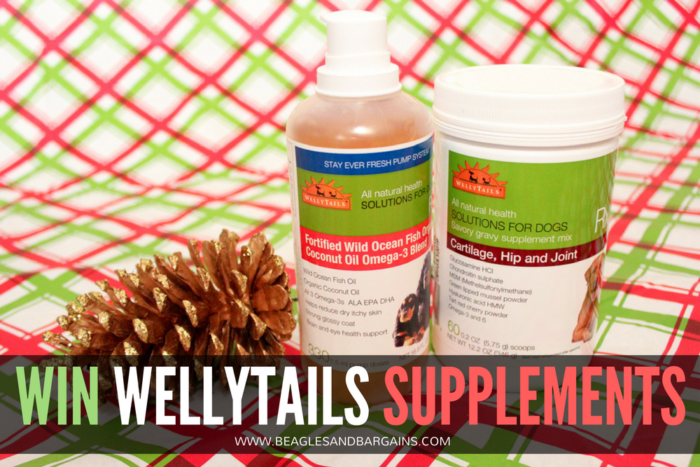 WellyTails also offers a Cartilage, Hip & Joint Supplement with all kinds of good stuff! In this supplement, you’ll find Glucosamine HCL, Freeze Dries New Zealand Green Lipped Mussel, all 3 forms of Omega-3s, Tart Red Cherry Powder, and more to help maintain your dog’s hip and joint health. As much as I love to plan and to stick to a schedule, I’m the WORST when it comes to having a cleaning routine. Probably because I don’t like doing it. But can you really blame me? To ensure my dogs and myself aren’t living in a pile of filth and germs, I’m going to set one up for 2018. Who knows… Maybe I’ll even share it here! In the meantime, if you want to create your own cleaning routine I highly recommend it (This is one of those do as I say and not as I do things). Proper grooming can be extremely important to a dog’s health and well being. Long nails can lead to poor posture and pain. Poor dental health can be a gateway to other health issues. And, lack of brushing and bathing can cause a damaged or dry skin and coat. Just what you need to include in your dog’s grooming schedule is going to depend on your dog and their breed (or mixes). Short haired dogs like Ralph & Luna, don’t need to be trimmed but they do need to be bathed, brushed, have nails clipped, and have teeth brushed. Maybe your dog requires fewer baths, but more trimming or maybe a blow out. Whatever it is, put a schedule together. You’ll be more likely to get these tasks done in a reasonable manner if you have a grooming time set aside each week or month. WellyTails has been a favorite brand of mine in the pet industry since I was first introduced a few years ago. I’ve had first had success with many of their products, but especially their Fortified Wild Ocean Fish Oil. I just love that WellyTails is a family based business and has set out on a mission to help pet parents show their pets love through honest nutrition in the form of foods and supplements. I even have the privilege of catching up with the WellyTails founders (John and Gladys) at several pet industry events throughout the year and they are a delight every single time! It’s clear to see how passionate they are about creating products with quality nutrition for our furry family members. If you want to learn more about WellyTails, be sure to follow them on Facebook and Twitter! 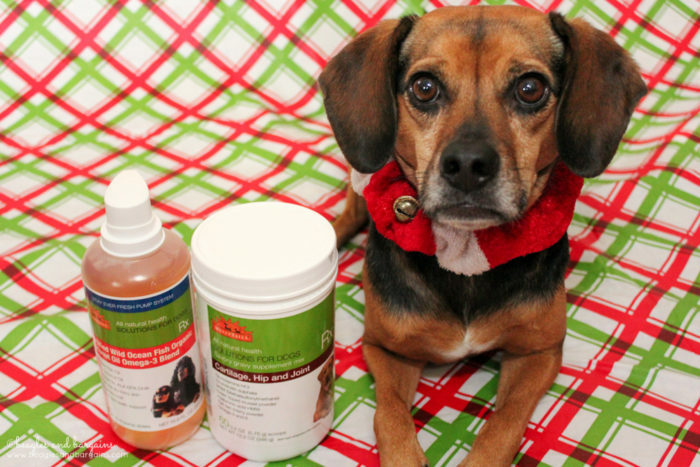 Don’t forget to check out the WellyTails website to purchase supplements for your dog, just in time for 2018! You can also save 25% off your purchase with promo code beaglesandbargains25. SIX lucky Beagles & Bargains readers will receive a WellyTails supplement! Residents of the United States and Canada (except Quebec) are eligible to enter via the Rafflecopter below. Entries must be submitted by 11:59 PM EST on Friday, December 23, 2017. Winners will be notified via email within 48 hours of the giveaway closing and will have 48 hours to respond and claim their prize. Three (3) winners will receive one (1) Fortified Wild Ocean Fish Oil & Organic COCONUT OIL Omega-3 Blend and three (3) winners will receive one (1) WellyTails Dog Supplement for Cartilage, Hip & Joint Health. Estimated value is $36.95 or $41.95, depending on prize. Don’t forget to check out our Holiday Guide! And don’t miss any of the 14 Stocking Stuffer Giveaways! What steps do you take to ensure your dog is happy and healthy? Do you currently use any supplements in their diet? 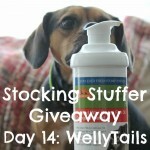 Disclaimer: WellyTails provided product free to review. 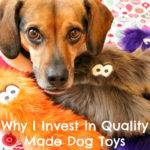 I am being compensated to help spread the word about WellyTails. I received no other compensation or additional benefits for mentioning the brands or products in this post. The opinions and ideas in this post are my own and are uninfluenced by any other person or business. WellyTails is responsible for all giveaway prizes including shipping.